Back in the day (that's how us olden folks say longer than the current solar cycle) Phil Kelly was a very young member of the GW Design Studio. He wrote the third edition "Codex: Eldar" and then created something special. "Codex: Craftworld Eldar" was the first of the third ed mini-dexes and it contained rules for five of the Eldar Craftworlds. This was the start of a blossoming of variant lists that gave 3rd and 4th Edition, its real flavour. In 2006 I built my first Eldar army. I had previously despised the PEGs and their stupid Starcannons, their silly Phoenix Lords that destroyed MEQs etc. 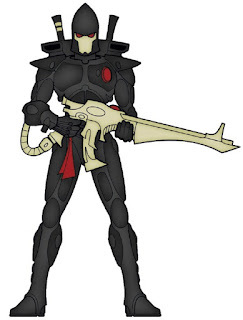 But with the Ulthwe I could build a themed army that was sufficiently different to Codex Eldar. The two unique Ulthwe units were the Black Guardians and the Seer Council. Black Guardians were the citizen army of the Craftworld and they had higher a higher Ballistic Skill or a higher Weapon Skill than regular Guardians. However unlike other Craftworlds (and indeed Eldar armies) two units were compulsory in your force. I had 80 in my army split into four units of 20. The second unique unit was the Seer Council. Here you bought at least two Farseers and three Warlocks but you could add to the unit. My Council was made up of 3 Farseers and 8 Warlocks – dubbed by locals as the “Seer Village”. Armed with Witchblades they were the bane of any vehicle they ran into generally able to dispatch even a Land Raider in a single assault. I used my Ulthwe at Liber Animus in Melboure in 2006 where I picked up the BloodThirster (Best General) award [I lost out on Best Overall to White Dwarf Editor Bryan Cook’s Vostroyan army by 0.5 point]. So the Ulthwe hold a special spot in my heart. I also had an Iyanden army and can honestly say I was probably the main reason why the Craftworld teetered on the edge of oblivion. Locally Wraithlords had an aura of invulnerability before I played Iyanden….afterwards not so much. I was responsible for the death of so many Wraithlords due to my general incompetence in keeping them alive. GW has announced that Craftworld Eldar is the next codex. I couldn’t be happier. The return of the thin white dukes as the Village rides again.